I am so excited about today's post. I love Christmas recipes, chocolate, and anything that's easy to make in the kitchen, so when Caroline and I whipped up this recipe for day three of our collab, I knew it was going to be good! This easy and delicious fudge is perfect for the holidays and doesn't require any skill or expertise in the kitchen. I know for me, the idea of making fudge always seemed a little daunting, but I was pleasantly surprised with how easy this whole process was! 1. Line your pan or pans with tin foil and spray with cooking spray. Caroline and I used two pans because we each wanted a tray for ourselves, but I think using one would make a thicker, more delicious fudge. 2. Pour the chocolate chips and condensed milk into the pan and constantly stir until completely melted. Be careful not to let the chocolate burn! *I think adding a few drops of peppermint oil to the mixture would heighten the peppermint flavor- I totally wish we would have thought of this! Caroline and I also added 1-2 tablespoons of canola oil to the fudge as it melted because the mixture was almost too thick to stir. 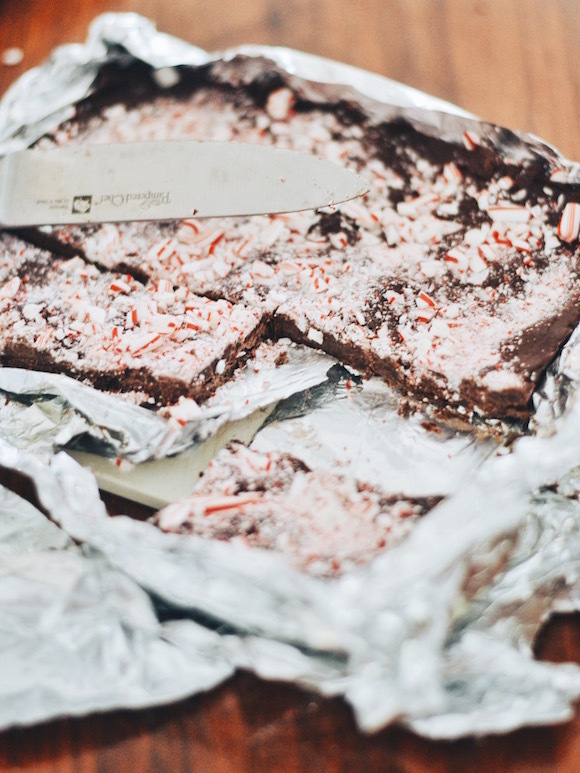 This recipe is seriously so easy to make and it's like Christmas crack, it's that good. Let us know if you try it! Yum, this looks amazing! I may need to bake a batch over Christmas break! Omg so easy, I think I need to whip this up!